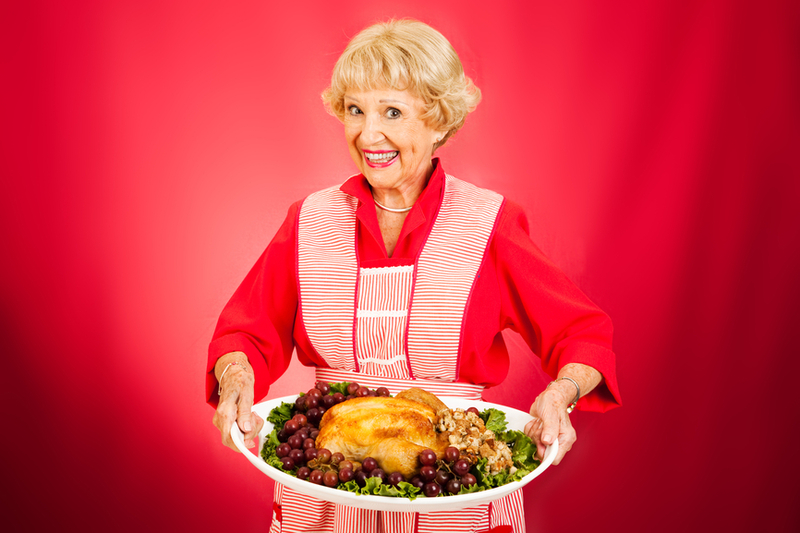 Thanksgiving is this week—the official kick-off to the Christmas season here in the US! When I was a kid, my mom made an advent calendar that we still have. Each day of December has a little pocket with a card inside that tells part of the Christmas story, and a small treat or a toy of some sort that goes with the story. My brother and sister and I all took turns getting whatever was in that day on the calendar and reading the card out to the family. I remember reading those cards and feeling like Christmas was taking absolutely forever to come. I ached for Christmas vacation and opening presents. Christmas Eve was the best/worst. We would be going bananas with excitement. My father had a hard and fast rule that no presents got opened until Christmas morning. My poor little brother about came unglued trying to convince my father to let him open just one on Christmas Eve. Christmas Eve I stayed awake almost all night with my sister. We knocked on my parents’ door around four in the morning trying to convince them that Santa had already come, but the rule was that the sun had to be up. Gahh! So close! Anticipation cuts both ways. The joy of what is coming gets me so excited, but it also frustrates me. I want it now! As funny as it is to remember how worked up about toys I used to get, in many ways not much has changed. I started dreaming as a teenager, and many of those dreams still have not been realized. I have so many major things left on my bucket list. Frustration can turn into discouragement. “Hope deferred makes the heart sick.” (Proverbs 13:12 NKJV) I want it now!! Delayed gratification is overrated for character building. Rational Anna tells me don’t freak out, that now is only temporary and that I’m still journeying forward, but Anxious Anna immediately dismisses this as irrelevant because right now, I want to be further ahead. I feel this compulsion to be doing what I want to do, not preparing for it. Sometimes it feels like my life is an eternal preparation for what is coming. If I don’t put Anxious Anna in check, I get myopically consumed with pushing the next thing forward. Everything on the perimeter gets neglected. It’s so funny how it works for us humans. When we are at home, we chafe to get out and travel and find adventure. When we are on the road, we can’t wait to get home. The grass is always greener and so forth. The good side of this internal push is that hopefully I will leave the planet a little better than I came into it. 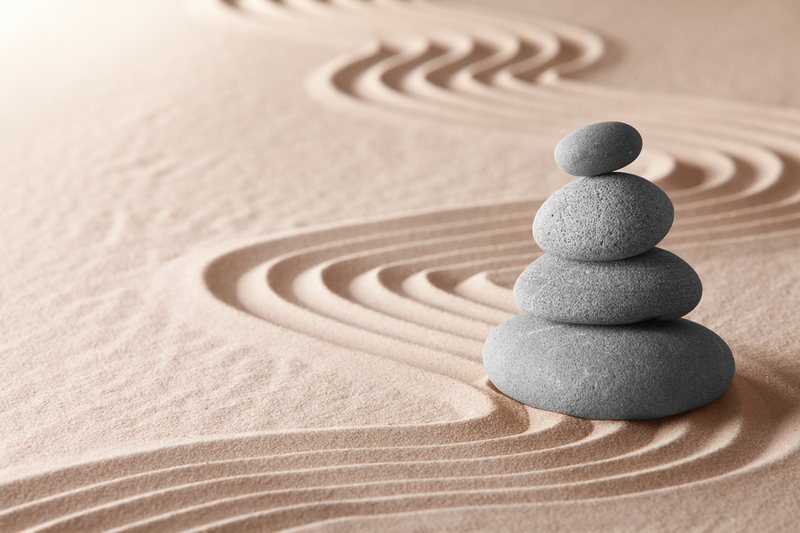 The ideal place to be is disciplined, pushing for a great future, yet at perfect peace with right now. Things will come to disrupt that peace (like the cabbie who sideswiped my car last night, grrr), but I am best positioned for making good choices for my family, and for my ministry and career when I live at peace in my heart. Every so often, I have to take a Selah moment to pause and remember. Not rushing over my thoughts on the way to another item on the to-do list. This is not an ordinary moment, but a quiet reflection, to pause and think about specific examples of his faithfulness to me. For me, they are glaringly obvious; I don’t have to think long. I remember the moments when God was gracious to me, giving me what I didn’t deserve. I remember the doors of opportunity that he opened for me. I remember the blessing of family and friends to love and who love me. I remember the financial freedom I have lived in most of my life. I remember how he made a little place for me in his plan of redemption. It’s a little overwhelming when I identify it. It makes me incredibly grateful. Gratitude makes space for trust. No matter what the future holds, I trust in Jesus. No matter what the present pressures, I trust in Jesus. He knows the way I take, and he guides my steps as I submit myself to him. Then I allow appreciate to rise in my heart. As appreciate rises, so does my love for him and my readiness to trust. These Psalms chart the course for my heart in those quiet moments. When my heart surges its wave of wild and free song of thanksgiving and love and joy, peace rides in with the surf that follows. Suddenly, what seemed so emotionally urgent and unsatisfactory a few moments ago fades as I find contentment in this moment, right now. I pray that this Thanksgiving, you know the perfect peace that comes from this kind of gratitude. P.S. The poem may be a random addition, but it seemed to fit. How long will I wait here paused on this ridge? Locked here, paused on the hill I have climbed. In the distance—bare granite peaks yet to be climbed. A few weeks ago, I w atched Malala Yousafzai accept the Nobel Peace Prize. At seventeen, she is the youngest person to ever become a Nobel Laureate. She didn’t betray even a shred of nervousness as she delivered her speech to an auditorium full of international leaders and dignitaries, cameras broadcasting her ideas to the world. I felt a wave of admiration for her confidence pass over me as I watched. I have been a teenager myself and parented three teenage girls. This kind of poise in a high-pressure situation is almost unheard of, especially for girls. I started to think about this question: what gives some people this kind of confidence? Confidence is one of the key features of successful leaders. It’s clearly something we have to cultivate, but so intangible. I’ve chatted with pastors’ wives and church girls who struggle with this, particularly when it comes to getting up in front of a crowd of people. They are often intelligent, beautiful, well-spoken girls, who just don’t see public ministry as their thing. It makes their voice quiver and their hands shake. They are content with behind-the-scenes leadership. This is totally fine if this is what you are called to do. I’m certainly not advocating that every girl needs to be good at preaching to be effective at ministry. Leading a team, however, will require that we have the skill set and the confidence to lead a meeting, whether small or large. We need confidence to make tough choices, and to confront the things that need changing. Some of us girls, comfortable in the background, need to start saying yes to husbands who push us to speak up in church. To do that, we need to develop greater confidence. We all have insecurities that rob confidence, and I am no different from the next person. We can change the externals with the right outfit, the perfect makeup and hair, or being seen with the right people. These things can help us put a brave face on it. True confidence, however, comes from the inside. It makes us attractive and real to people. After a few days of contemplation, I’ve come up with five things that have helped increase my confidence over the years. 1. Get a fresh revelation that you are treasured by the one whose opinion matters most. I will never forget those months when my husband, John, started dating me. He was decisive and deliberate in his pursuit of me, no games. I felt incredible, desired and valued. When a real man pursues you, it brings with it a whole new level of confidence. You feel smarter, more beautiful—more everything. When I’m with John, I feel confidence from his support and his value. If you have ever experienced this, you know what I mean. If you have never experienced this, don’t worry. You get an even stronger rush of confidence from the revelation of just how important you are to Jesus. Understanding that the most powerful being in the universe is completely gaga about you, just as you are, brings confidence to your heart. It causes your shoulders to straighten a bit, and your chin to lift, and a little smile to hover around the corners of your mouth in every-day circumstances. That kind of man is pursuing you. You must be pretty awesome. 2. Know that what you do matters: you have a very great cause. Malala Yousafzai is Pakistani. She grew up in the Swat Valley with parents who are educators. The Taliban gained influence in the region during her childhood, and ruled her valley by the time she was eleven years old. As one of their first acts, the Taliban decreed that no girls would be allowed to go to school. Malala started a blog advocating for education for girls and has continued to work as an activist since then. Two years ago, she was shot in the head by a Taliban agent and survived. Two weeks ago, she was awarded the Nobel Peace Prize. You can watch her acceptance speech here. As I mentioned earlier, she is remarkably poised and confident. What is the difference between Malala and every other seventeen-year-old girl? Why is she so confident? She has facial scarring from being shot, is from a backward part of the planet, without the family connections that could teach her grace and poise. She has every reason to be a shrinking violet, inspiring but retiring. She has one thing though. She is deeply passionate about a very righteous cause—the right for every girl to get an education. When the Philistine giant champion, Goliath, threatened the armies of Israel, David stepped up for the fight. His older brother saw his confidence and accused him of arrogance. David’s response was simple but so profound. “And David said, “What have I done now? Is there not a cause?” (I Samuel 17:29 NKJV) A great cause gives us great confidence. Sometimes we minimize the importance of our work in church. Leaders may hesitate to encroach on people’s busy schedules and family time. We need to draw on the confidence that comes from deep passion for the great cause of salvation. People nearby have an urgent need to hear the truth of Jesus’s saving grace. Is there not a cause? Remembering the urgency of our cause makes us very confident. 3. Think the right thoughts: Choose to view the team around you as an extension of your abilities instead of competition. We females are notorious comparers. We walk into a room and check out who is prettier; who is thinner; who is more talented. Ladies are notorious for picking on the pretty girls. We have to change our mindset about this, and stop thinking of these girls as a threat. Paul said we run this race in such a way as to win a prize. This race, however, is more like a relay than a hundred meter sprint. It’s a team race. We only win when we make sure a bunch of other people cross the finish line with us. Because this is true, the people on our team are not the competition. The leaders at the big church in town are not our competition. If you take a sense of ownership of what the team achieves as a whole, who gets the credit matters far less. You can be excited for the achievement of others, and the strengths of others, because this improves what the team accomplishes. Their abilities make your efforts more effective. You won’t be as nervous to get up in front of gifted leaders if you take as much pride in their work as in your own. In this kind of environment, no one is judging or evaluating anyone else. We are working together toward a common vision. This thought can build great confidence. You don’t have to be the best at everything, or even the best at one thing to lead. We can find confidence in the fact that we have awesome people working with us, supporting us. 4. Find the balance: Care what people think but don’t care what people think. This sounds confusing, but it’s true. We have to care what people think if our job is to influence people. The way they respond to us matters. But there is a difference between caring what people think and caring so much that you internalize their rejection. Okay so maybe it’s still fuzzy. This is what I mean: If I am so worried about what people think about me that in an effort to impress someone, I change who I seem to be, I’ve crossed a line. At that point, I’ve cared too much what people think about me. On the other hand, someone needs to be following where I lead, so I have to pay attention to what is happening around me. So how do you do find the right balance? This comes from a soul that is rooted deep in Christ. He defines our ideals. If you shape your identity to look like Christ, who you are is never in question. When you know who you are, you don’t change depending on whom you are with. Our culture is obviously obsessed with celebrity, aka fame and fortune. Unfortunately, people who have achieved this certainly aren’t guaranteed happiness, latest case in point being the tragic and sad death of Robin Williams. We don’t have to work the room or chase the right connections in an effort to be someone important. It’s this simple: Know what you are called to do, and do it. Invitations to minister somewhere else do not validate your ministry. Fruit validates your ministry—the fruit of your life and character, and the fruit of what you have cultivated in people’s lives. Everyone will have an opinion about our leadership, and every opinion will be different. To some extent, you have to shut out the voices and just push forward. On the other hand, we need Godly coaching, and we need to make sure someone is following where we lead. 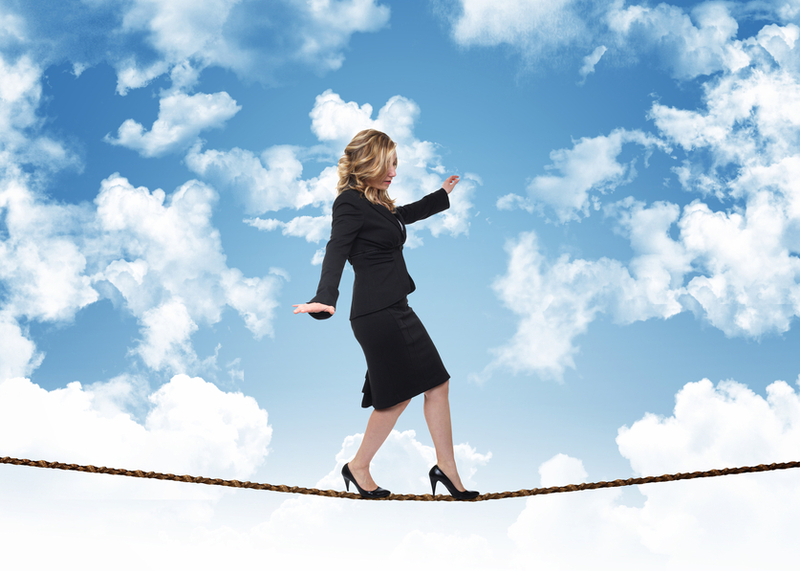 Understanding this balancing act and getting it right produces confidence. Have you ever noticed that old people have no verbal filter? My eighty-four year old grandma will say anything. This is sometimes good and sometimes bad. She swears like a sailor, but in between, pops out great nuggets of wisdom that I treasure. Things like, “The best mom you can be is a happy mom. Do what makes you happy.” Then she drops the S-bomb two minutes later. Experience has given her confidence to speak her mind. Practically nothing builds confidence like practice. When you have done something a thousand times, you know you can do it. You know your material, and it’s easy to pop into the familiar rhythms. If you just keep going and don’t quit, you will develop experience. If you keep educating yourself and practicing, you will get better. Experience and growth develop confidence. We all fail sometimes; it comes with the territory. Don’t freak out about it. Just stay focused on vision for the future instead of failures of the past. The longer you are in this journey, the better and stronger you will become. This will produce greater leadership confidence in you. I am flying to New Zealand this week to watch my daughter Chloé graduate. She’s worked hard, and I’m very proud of her double major in Psychology and Education from the University of Auckland. There is something about seeing your kid graduate that makes you let out an internal sigh of relief. We finished our duty of forced education, and the result has been good. All three of our girls are my stepdaughters. I don’t like the term “step.” It makes me cringe on the inside. It seems to verbally create a separation that we have worked hard to eliminate. Even the term “blended family” can sound violent. 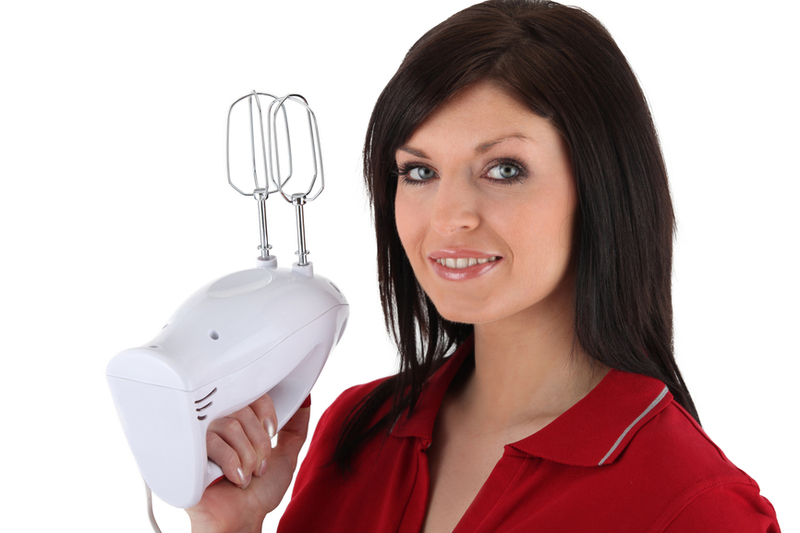 It works okay if you think of it less like an electric blender and more like an artist’s soft blending brush. These terms are harsh, but creating a new family has actually been a very satisfying journey for me. To celebrate Chloé’s success this week, I want to share some of the things John and I have done to parent our girls. All three of them are gorgeous, sweet, and strong. They are easy to love. Like all kids, they have had their share of struggles and mistakes, but they have navigated life quite well. Before John and I got married, he ran a household of fun. The Ping-Pong table enjoyed a permanent setup in the living room, roller skates were perfectly acceptable indoors, and the pantry was stocked with an array of sugar-packed junk food. Bedtimes were non-existent, and church youth leaders came through at all hours. As a single woman, I had a quiet, ordered and neat condo, where every kitchen bowl and fork had an assigned location and my closets were organized by color and type of garment. When the two of us married, we had to meet in the middle, starting with the double mountain of laundry: clean vs. dirty. The girls had no choice but to adapt to the compromises John and I made. John and I read several books on blended families before we got married, but one in particular had really practical advice and struck us as great sense. Ron Deal wrote the book, The Smart Step Family, which I highly recommend that anyone parenting a blended family read. The major points of the book have stuck with me over the last nine years. They really helped us be successful. The first piece of advice was to chill out, and lower your expectations. 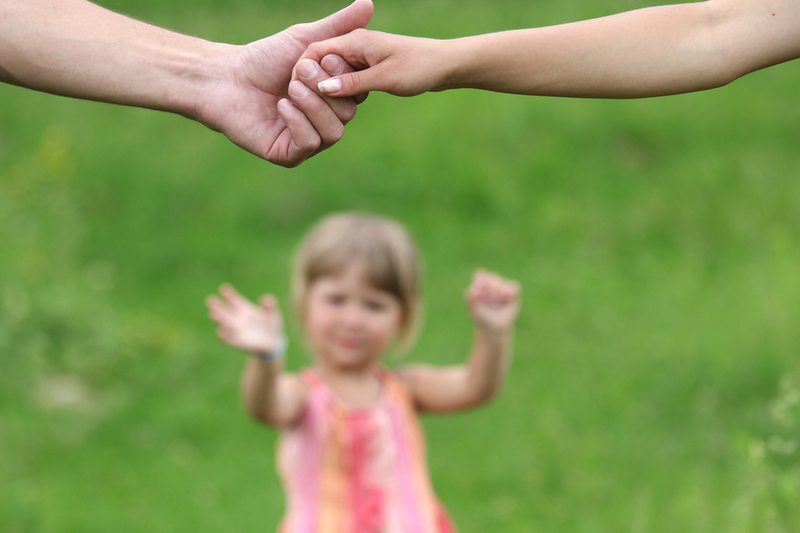 It takes a long time for a kid to see their stepparent as a parental figure. Mr. Deal says to view the relationship as a crockpot, not a microwave. Use low heat over a long time. It’s pretty much the opposite of the passionate love affair you have with that child’s parent. The experts say if your stepchild child is seven when you marry, they will not likely see you as a full parent for another seven years. You can’t rush it. Just like any leadership relationship, it takes years to get close. Connecting to a child takes even longer because you have very little in common. Calm patience that stretches over years is required. The demands of cultivation and such slow germination mean that the relationship becomes incredibly precious when it finally flowers. The second bit of advice we followed was to allow the biological parent to be the disciplinarian and to lay down the rules. We determined together what the rules were, but when it came to the hard conversations, John took the lead. When discipline was needed, we discussed it, but John handled its dispensation. I had to mentally prepare myself to financially take on children who were too young to appreciate the sacrifices I was suddenly making for them. When I was single, I spend my money on what I wanted or needed. As a stepparent, you don’t have the hormonal instincts to put your kids first. Instead of being a biological imperative, it’s a decision to love. 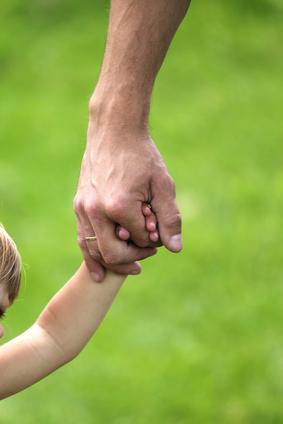 In this respect, step parenting was one of the most unselfish things I have done. I had to love them way God does, giving with no expectation back. This was not easy, and I certainly didn’t do it perfectly, but it deepened my character in important ways. Parenting made me less self-centered. For so many, this requirement of step parenting comes as a surprise that may take out their marriage. John and I have been able to communicate really well about our thoughts and feelings. We had a deal between us that I would never put him in the position where he had to choose between his girls and me, and in exchange, he would prioritize my needs first. He is an amazing father and husband. He worked hard to include me in his parenting rather than make decisions about his girls in isolation. I have tried to be aware of my emotions and as honest with him as possible about my feelings and what the real issues are. I have heard some real blended family horror stories. These girls are just as responsible for our successful blend as John and me. They wanted me in their family, and that has made all the difference. When John and I started dating, the girls were away. Sharayah was fifteen at the time. She told me last year that when she came back home, her dad was happier than she had ever seen him. Before she ever met me, she told herself that whatever was making him this happy had to stay. She was determined that we would work, for the sake of her father’s happiness. That’s one remarkably selfless fifteen year-old! Chloé and Brooke have been just as open and welcoming. None of the girls have ever pushed me out or been defiant. Parenting in a leadership environment can be tricky. Everyone has an opinion about your kids’ behavior, and most of the time, they are held to a higher standard than normal kids. We have done our best to talk through these moments as they arose, encouraging the girls to view people through eyes of grace. We trust that most people mean well, even when they are misguiding or hurtful in their advice or comments. I have a friend who is a pastor’s kid who remembers being told as a kid to shape up because people were watching. If we teach our kids to behave because of leadership pressure, chances are they will wind up resenting the church. I believe a better approach is to teach our kids to make good choices both for their own good future and to please Jesus with their character. We have worked to create a culture of trust in our family. We trust our girls, and honesty is a vital part of maintaining that trust. Trusting them meant we haven’t violated their privacy by digging through their things or their communications. When you believe the best about people, they want to live up to your standards. Kids want to make us proud. I’ve seen the hurt in our girls’ eyes when they felt like they had disappointed us. I remember feeling that with my parents. We create the identities of our children by the way we treat them and speak to them. If we treat them like hooligans, that’s who they will believe themselves to be. If we treat them with respect and value, that’s who they will be. Like all parenting, this is built over a long, long time. These conversations helped me understand that small decisions can have significant impact. I made good decisions most of the time, but I didn’t always. My parents were never enablers of poor decisions. I had to fix my own mistakes. When I got in so deep I couldn’t get myself out, they would help me, and because I wasn’t expecting help, I was overwhelmed with gratitude. I’ve tried to help our girls see that the little decisions add up to big consequences. It’s a delicate balance, however, because we try to love a whole lot and lecture very little. For this week, however, I couldn’t be prouder of the choices Chloé has made. All three girls make me proud, but this week is for Chloé. Have you ever known someone who seemed to have an unfair advantage in ministry or life? It seems like every door swings wide open with opportunity and success for them. I have many friends like this, but one in particular that I envied. She is a long-time friend from high school. She seemed to get handed every ministry opportunity that I wanted, and as much as I loved her, sometimes I really struggled to like her! We need successful and influential friends. They challenge us and provoke our growth. As much as it’s good for us to have friends who are farther along than we are, sometimes they make you want to beat your head against the wall. When you are fighting for every step forward and watch them sail past effortlessly, it can make your teeth clench involuntarily. Sometimes I have been glad and excited for friends’ successes, but other times, not so much. It’s not that I resented their advantages, but I wished for some of the favor they enjoy. God loves everyone equally, but the Bible talks about certain people that God’s hand was on. These people had an extra measure of help toward success when God’s hand was on them. The hand of God can be brutal towards his enemies, but when it’s on you—you have the “it” factor, a guaranteed advantage. John the Baptist was a special child. People could see something different about him and expected more from his life. “Everyone who heard about it reflected on these events and asked, ‘What will this child turn out to be?’ For the hand of the Lord was surely upon him in a special way.” (Luke 1:66 NLT) John became one of the most influential men of his time. Clearly the hand of the Lord can give a tremendous advantage. It destines you for greatness, and gives you confidence in front of powerful people. It helps you hear God clearly and see where you are going. So how do you get his attention? Is it as simple as asking him to put his hand on you? When I was a kid, my parents applied their hands to me frequently. A hand on my shoulder meant settle down, slow down. When dad held my hand, he restricted me. I could only move when he moved. His hand on my head was affectionate, and his hand on my backside was discipline. Most of the time, his hand was coaching my behavior, but I knew I had his attention. Our willingness to let God take the lead makes all the difference. It’s easy to say that we want him to lead, but not as easy to actually follow. When Jesus uses leaders in our lives to correct our course, how responsive are we? If we are needed to serve in areas that we aren’t naturally interested in or passionate about, how hard do we work at it? How available are we for what he asks us to do? Does it need to fit into the hours agreed on in our staff contract, or the hours we committed to serve? God’s favor is connected closely to God’s coaching. Coaching narrows the options for behavior, just like a hand on our shoulder. In order to enjoy the advantages of God’s favor, we have to be willing to allow him to guide our behavior and our choices. John the Baptist was led into the desert to eat bugs. Ezra went into hostile territory to rebuild a ruined city. Elisha had to raise a boy from the dead. Evidently, God’s favor doesn’t necessarily result in a life of luxury and ease. But it does mean that what we do will have significant impact. What does it mean to fear the Lord? This word denotes respect, honor, and reverence, as well as raw fear. It’s the awareness that God cannot be managed, manipulated, or molded into what we prefer. He is supremely powerful, and can only be served, not bargained with. Living our lives with that awareness keeps deference for him in all our choices. “Charm is deceptive, and beauty is fleeting, but a woman who fears the Lord is to be praised.” (Proverbs 31:30 NIV) It’s just a smart decision. This kind of fear produces great confidence. When God’s hand is on me, I get access to all the resources he has. Proverbs describes a woman who had the “it” factor. She is incredibly confident because she knows God is with her, coaching her and backing her up. “She is clothed with strength and dignity; she can laugh at the days to come. She speaks with wisdom and faithful instruction in on her tongue.” (Proverbs 31:25 NIV) For a leader, it doesn’t get much better than that! I’m praying for this kind of favor to cover you, and the hand of God on your shoulder today. If you have been leading for longer than ten minutes, then you have had someone leave you. I’ve had quite a few people leave my teams over the years. The first time I had someone leave me that I really cared about and had invested in, I didn’t handle it particularly well. I had been working with this young guy since he was a teenager. He was a super talented musician, sweet natured, humble and gentle. He felt called to ministry, and he had the raw potential to do something significant for God. When a gifted, older man joined the team and began to connect with this young guy, I felt uneasy. This man had very strong opinions and began to negatively influence my young protégé. About a year later, this young man decided to leave when a small church offered pay to come do their music. I was angry and disappointed, and I made sure this young man knew it. I felt like he had short cut his destiny and abandoned his team for a side gig and a handful of cash. My response wasn’t particularly loving. I cut off the relationship. 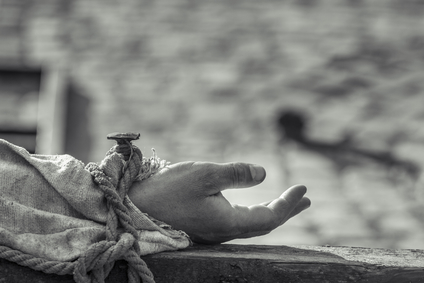 I made sure he understood that I wasn’t releasing him into ministry; he was leaving us. Every leader struggles to let valuable people go. We needed them and invested our best in them! Us female leaders seem to get particularly hurt when people leave. The maternal instinct in us connects to people, and when they leave us, it feels like one of our kids has just abandoned us. How do you walk away from family? 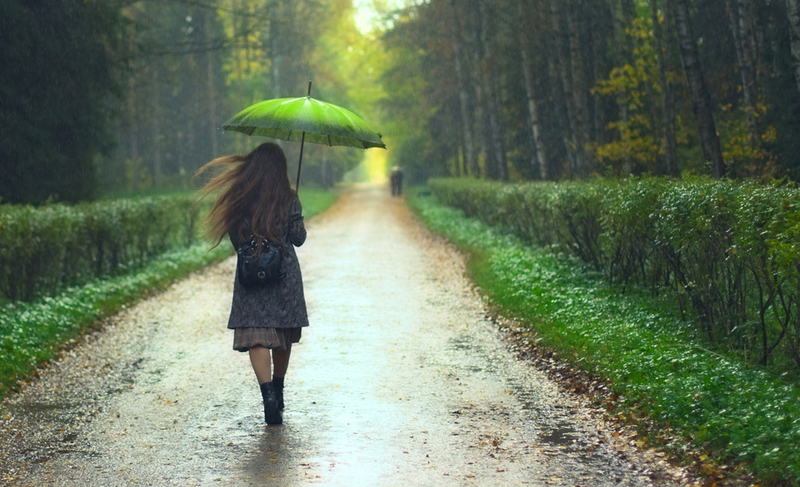 If someone you loved leaving has hurt you, it can be very hard to trust again. It makes us very slow to let new people into our inner circle. When the betrayal is bad enough, those doors may close permanently. If we succumb to this instinct for self-preservation, we keep our leadership impact small with fewer authentic relationships. It is possible to have people leave us without being hurt or ending friendship. One of the most valuable leadership skills we can develop is to release people instead of rejecting them when they leave. I’ve been a Christian serving in church for about twenty years. About a dozen different leaders have invested in me in different seasons of my life. They all contributed to who I am today. I needed what each gave me, just like I needed my kindergarten teacher as much as I needed my 12th grade English teacher. God trust leaders with people for a season of their life. The fact that it’s only temporary a in no way reduces the value of our influence in their lives. The residue of our investment continues to build people’s lives long after we are gone. We tend to want people draw clear lines of where their loyalties lie–in or out, black and white. Paul challenged this thinking. “For when one says, “I follow Paul,” and another, “I follow Apollos,” are you not mere human beings? What, after all, is Apollos? And what is Paul? Only servants, through whom you came to believe—as the Lord has assigned to each his task. I planted the seed, Apollos watered it, but God has been making it grow. So neither the one who plants nor the one who waters is anything, but only God, who makes things grow. The one who plants and the one who waters have one purpose, and they will each be rewarded according to their own labor.” (1 Corinthians 3:4-14 NIV) Paul reminded us that we are all on the same team! With this in mind, I don’t need to hang on to people so tightly. I’m not developing people for my thing; I’m developing people for God’s thing. The quality of what we have built into people’s lives will speak for itself. This passage continues on to explain how fires test what we have built in people’s lives. The true quality test of what we have invested is not proven by how long people serve on our teams building our ministry. The character revealed when those team members go through hell later proves the quality of what we have built. Leaders can feel really awkward around people who have left them. The relationship changes, and we have to change with it. When your kids grow up, you have to figure out how to relate differently. You aren’t going to spank or hold your adult son’s hand to cross the road. In the same way, your relationship has to change when people leave you. Feeling the awkwardness, we often just let the relationship go, but this may be a mistake. A new season in someone’s life doesn’t have to sour the old season. Sometimes the reason people move on is as simple as God bringing them a new season. It’s not always a personal rejection. Transition is always awkward, and change is hard, no matter how good the relationship is. It’s the most difficult when we are convinced someone is making the wrong decision, or when people leave badly and hurt us. Jesus expects us to forgive, again and again. This is easy to teach, harder to put into practice. I have to take these moments to Jesus and ask him to help me and give me grace for the person who has disappointed and hurt me. If we are honest before God about our hurt and dismay, he will help us and heal us. Sometimes we feel like we need to justify ourselves to our church or our teams and talk way too much about the circumstances surrounding someone’s departure. This is especially true when people are leaving nastily and publicly. When we bleed all over the rest of our team it just adds fuel to the flames. This is totally unnecessary most of the time. It’s better to verbally honor and value what that person brought, answer any questions privately, and move forward without excess drama on your end. God will replace them in our ministry when we just move on. Let’s keep our spirit sweet and show the love Christ commands us to. I’m not suggesting that we run after people who leave us. We have to stay focused on the people with us and the work God has called us to, absolutely. What I am saying, however, is let’s not use ministry busyness as an excuse to cut relationships out of our life when the real reason is that they hurt or disappointed us. Leaders love to take the credit for the success of someone who trained under them, but if they fail it’s because they left us. Ha! We have a responsibility to train people, but Paul said that it’s God who actually grows them. We have a part in their fruitfulness, but we don’t own anyone; they belong to Jesus. This heart helps us release people into new seasons of fruitfulness with joy, knowing we had a part in their development, and that what we built in them is lasting. A few weeks ago I had coffee with a young leader I released a few years ago. I had handled his departure very differently, and kept this relationship intact. I was so pleased to see his growth since he left. He is flourishing, and adding incredible value to his church. That day, he wanted to chat about a leadership issue he was struggling to navigate, and we talked it through together. It was so good to be able to invest again into his world in a different season, in a different way. I believe this is the way Jesus wants kingdom relationships to be: without awkwardness, hurt, or unspoken issues. That way we can be unclouded and proud of the investment we make in people’s lives. Our lives can become more significant through building someone else. Have you ever wished you were braver? Maybe you saw an outfit or haircut you liked and wished you had the courage to pull it off? Or have you ever wished you had the guts to talk to the guy you liked without imploding? 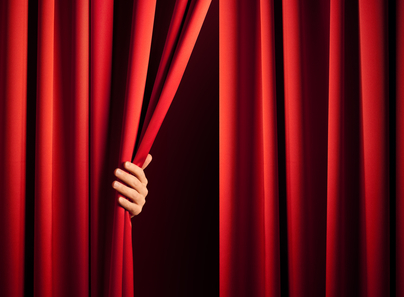 Have you ever wished you were braver when it comes to public speaking. I have never had a loud, big personality. As a kid, I was laid back, a soft talker. It’s not that I was shy, but just never liked to interrupt or talk over someone else. I was definitely not particularly brave or courageous about putting myself out there. My husband wishes I were still more like that, because he hates it when I interrupt him. I have, however, grown up into a more forceful, strongly opinionated, yet often reserved, contemplative person. As I am still relatively quiet, it often surprises people that I have spent most of my career up in front of people. It’s not usually the personality type one associates with the stage. My parents got me music lessons when I was very young. I was just focused (or obedient) enough to keep with it, and enjoyed it enough to keep me interested. Average talent combined with lots of practice hours granted me some ability, and eventually the worship leader recruited to play in our church. This was no cakewalk for me. As a pre-teen, playing with the adult band terrified me to the point that I used to turn my amp so far down I couldn’t even hear myself, just to make sure no one else could! When I went from playing to singing in church, the nerves only got worse. My heart would somehow suddenly be up in my nose, choking me. In high school, my buddies and I started a band that we lovingly dubbed, Curious George. Sadly, Curious George had just one performance before folding. We played for our youth ministry, and this was the first time I had ever sung a legit solo to a packed house. I got out on stage and heard my own voice coming out of the speaker in front of me and was completely thrown. It was totally disorienting for me because it didn’t sound like the me in my head. We were playing a Cranberries cover, and my face was probably looking pretty much like a Cranberry too. I felt like God was calling me to ministry. In those days, female preachers weren’t really celebrated, barely tolerated. Twenty years ago, being a pastor’s wife, a secretary, or a worship leader was the most typical female ministry role. With these options available, I decided that I was going to major in music in college and become a church music pastor, in spite of my nervousness. This decision shifted something in me. Before I felt that call, I got normal performance jitters, but afterward, it turned into something more like terror of failure. I really wanted to be useful to God. I felt inadequate frequently, and scared that I would not be good enough. As a teenager, it didn’t help when well-meaning pastors in my life gently encouraged me to pursue something else. I was just stubborn enough to keep trying. Because God is faithful to me, he made room for me when I wasn’t looking for it. I had settled into a behind-the-scenes role as a youth pastor’s wife and was happy there when my pastors pulled that comfortable rug out from under me. They asked me to lead the worship ministry. I was floored. To begin with, I was younger by several decades than most of the amazing singers and musicians I was being asked to lead. Many of them sang or played professionally. To top it off, these were church services of a couple thousand people. I struggled to say yes to that opportunity. I had to ignore the churning in the pit of my stomach, swallow hard, and try to find my brave face. I knew God was asking me to be obedient, but it was the scariest thing I’d ever done. People aren’t born with courage. It’s not a personality trait, it’s a heart-wrenching choice. Courage is closely related to faith. I find courage when I quiet all the good reasons in my head not to do something and let my heart lead instead, propelled forward by the hope for something greater. Sometimes courage is letting go of our common sense and the internal security measures we all have. We can become the heroes of our own story if we decide to face down what intimidates us. My daughter, Sharayah, loved the Divergent series, so I downloaded it for a series of long flights I took recently. It’s an entertaining and easy read, with the added bonus of being thought provoking—good vacation novels. One of the books’ major themes is bravery in the little things. The author, Veronica Roth, chose the word “dauntless” to describe her lead characters, which means bold, unintimidated, daring, brave, or courageous. Her story illustrates how courage can take many forms. You don’t have do extreme acts like walking barefoot over hot coals to be brave. Courage is sometimes the strongest in small, every day acts. It takes courage to commit, to trust, to hope, especially when you have experienced rejection before. The older we get and the more life we have seen, the more courage that those risks require. Bravery isn’t the absence of fear, but acting in spite o f your fear. Courage begins with the first step forward. How can you become the hero of your own story? 1. Be brave in the little things first. Financial struggles can be one of the most daunting challenges we face. Because it feels so overwhelming, it’s easy for us to stick our head in the sand and avoid dealing with it. Facing this can be one of those small acts of extreme courage. Start by being brave enough to open the bill you know you can’t pay. That little act of opening an envelope may be the bravest thing you can do. That first step gets you on your way. You can either try to ignore failure, be overwhelmed by it, or try to tackle it. If you don’t have the courage to tackle the whole thing, try another small but brave step first: Ask for help. Be brave enough to eyeball the area of failure you have fought for years and put up your fists again. If you can be brave enough to be free of secrets, you can get free of just about anything. 2. 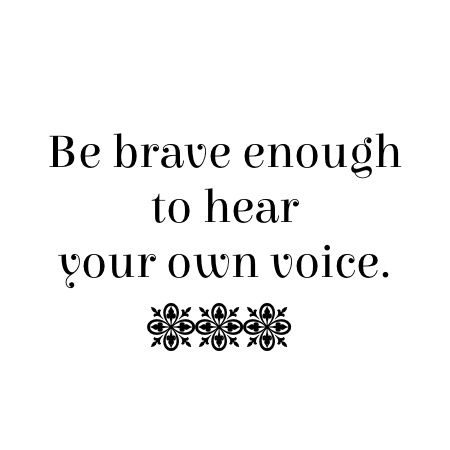 Be brave enough to hear your own voice. For the most part, worship teams are cover bands. We listen to great songs and then play them for our church. If it’s a popular song, people want it to sound like the recording. When you are covering a song it’s not that hard to duplicate guitar tone, keyboard sounds, or beats nearly perfectly. What you can’t replicate is the voice. Your singer will never sound like the guy on the record! Voiceprints are absolutely unique. Nobody can sound exactly like anyone else. The same thing applies to our communication. 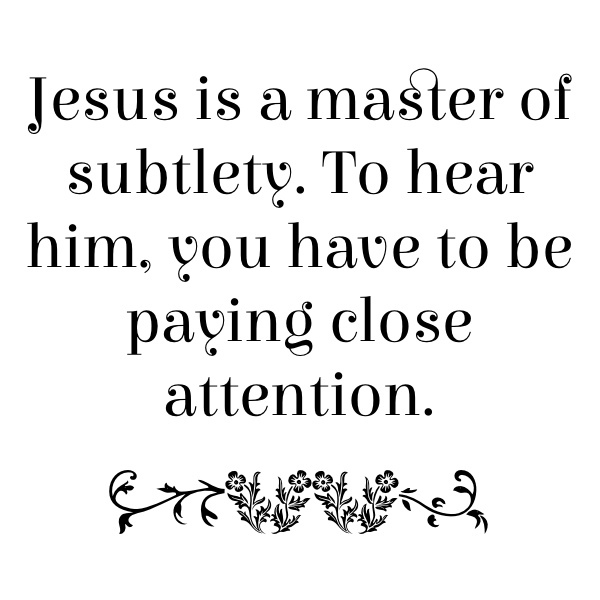 You won’t ever preach just like Chris Caine or Joyce Meyer, because Jesus never meant for you to sound like anyone else. He gave you a unique voice because he gave you something to say that no one else can! Finding your voice is perhaps more about having courage than anything else. Be brave enough to believe that you have something valuable to say! Ask God to lead you, and speak up when you feel strongly about something. 3. 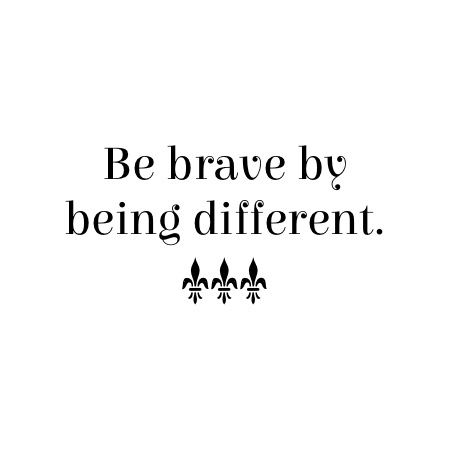 Be brave by being different. It takes a little bit of courage to be okay with being different. The best version of me isn’t when I look and act just like the people I respect, but when I get comfortable in my own skin. The more comfortable we are with who God designed us to be, the easier it is to access the unique gifts God gives us. You aren’t meant to blend in, but to stand out! We aren’t just out here naked on our own, hoping it’s adequate. God told Moses, “See, I have chosen Bezalel son of Uri, the son of Hur, of the tribe of Judah, and I have filled him with the Spirit of God, with wisdom, with understanding, with knowledge and with all kinds of skills.” (Exodus 31:2-3) God chose Bezalel, and he gave him exactly what was needed to do the job God called him to do. The Holy Spirit makes us more than we are! 4. 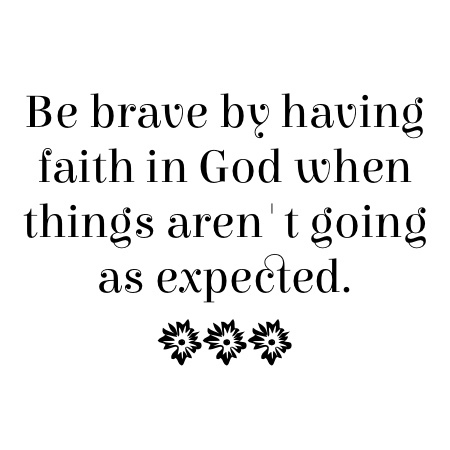 Be brave by having faith in God when things aren’t going as expected. After Moses led Israel out of captivity in Egypt, in Exodus 32, they paused at Mount Sinai to hear from God about the next step. While Moses was up on the mountain talking to God, everyone else got tired of waiting. They pooled their valuables and made a statue of a calf and worshipped it as their god. For a long time, I read this story and felt a little superior. How could they be so dumb after God rescued them? The truth is, unfortunately, that I’m really not that different. 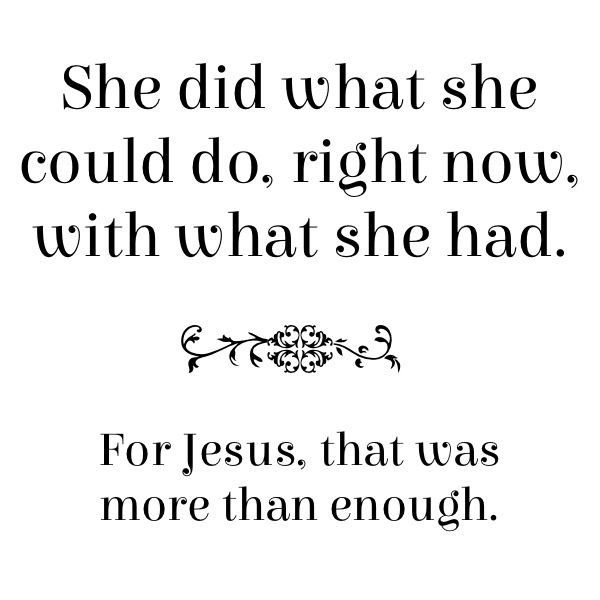 When I feel like God is taking a little too long, I can be pretty quick to transfer my trust from Jesus to what I can make happen with my own skills and resources. We all can be tempted to make things happen on our own, just like Israel did. The first step toward faith in challenging seasons is courage. God loves and rewards faith. We can access that favor by daring to believe God when things aren’t looking the way we want. That kind of bravery is a true act of courage. 5. 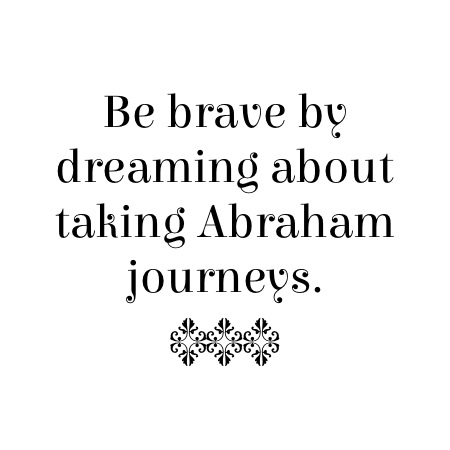 Be brave by dreaming about taking Abraham journeys. I grew up in a remarkably courageous family. Sometimes I think about it and am amazed at the brave choices they have made. My father left his well-paying and prestigious career at IBM, and at over fifty years old, moved across the country to become a pastor. At twenty-one years old, my sister left America, all her family and friends, and moved to a third-world country to be obedient to the call of God on her life. My brother moved to China to marry a girl he fell in love with online. My mother got her doctorate at fifty-five years old and started a brand new career. I have enormous respect for these kinds of risky, dream-chasing, courage choices! I recently got to chat with Taya Smith. She told me her story, about how she grew up in a tiny town in New South Wales, Australia, and moved to Sydney after high school. She got involved at Hillsong Church in the youth ministry leadership team. She had a dream to sing, and decided to audition for the Voice. She made it to the finals, and the producers told her that she was about to be offered a record deal. That same week, the Hillsong music producer asked her to come in and lay some background vocals for the new United album. She hadn’t been involved in music at Hillsong, but said yes anyway. When she arrived, they asked her to go ahead and record the song, “Oceans.” That very next weekend, she was leading worship for one of the campuses. The following week, Hillsong hired her as one of their worship leaders, and the rest is history. She had no idea when she left her hometown that this would be her journey! In just one wild, crazy week, God put her on the road to his purpose for her life. What if she had never left that little town? God must really like something about journeys of faith. God asked Abraham to take one of these make-no-logical-sense journeys. When Abraham was obedient, it literally changed history. We can’t see the end result of these risky moves, but God does. That kind of bravery starts by asking yourself the question, what matters so much that it’s worth letting go of what is safe for the chance it might succeed? Dare to dream, and see what God does! 6. 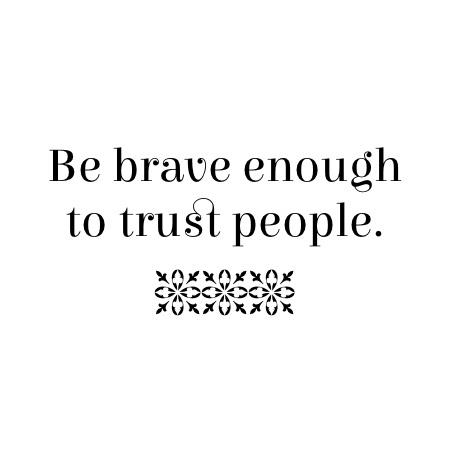 Be brave enough to trust people. Pastor’s wives in particular seem to be a magnet for betrayal. I have met many who have mostly closed their emotional doors. They trust their family and maybe a few key friends, but most of the rest of the world gets held out at arms length. I suspect that this is true for many other women too. Only a brave woman will choose to trust people when she has been hurt in unimaginable ways many times before. Risk assessment will always keep your world small when it comes to relationships. The famous passage in 1 Corinthians 13:7 says this about love. “It always protects, always trusts, always hopes, always perseveres.” That divine kind of love never ceases to be a force pushing forward, even in the face of rejection, of neediness, or betrayal. Its God-like selfless quality is what makes it so special. That kind of love marries heart with action. It risks the pain for the hope of what is greater. Can you be brave enough to keep pushing your circle out rather than shrinking it in? It just takes a little bit of courage to be like Jesus, and give someone another chance. In our fight to get through this life, Jesus isn’t sitting at the judge’s table, no matter who else might be. He’s in our corner, behind us, coaching us and cheering us on! He promises to be our Advocate, the attorney on our side. He is the big brother who protects us from bullies. It’s way easier to pick a fight with our problems when we know who we have backing us up! Peter made a famous and courageous walk on water a long time ago. He evidently thought the goal was worth the risk, and he trusted that Jesus had his back. What courageous act God is asking from you? 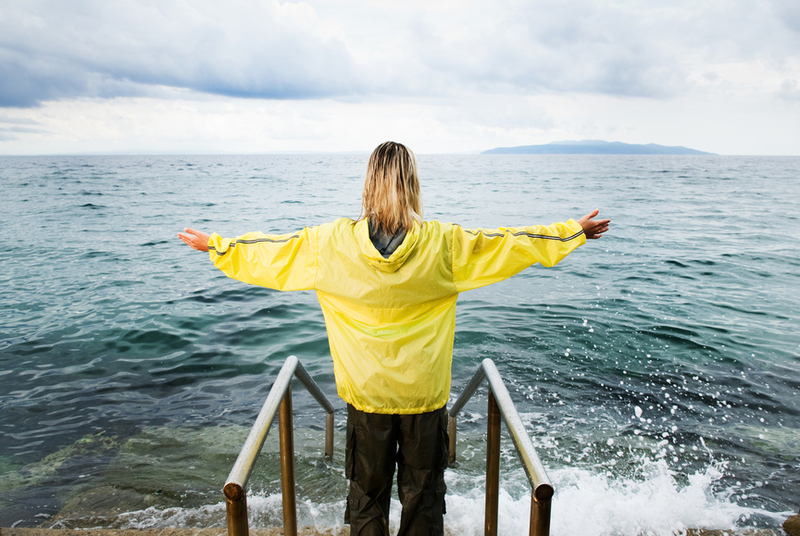 Bethel Music recently released the song, “You Make Me Brave,” about stepping out onto the water. Hillsong United’s “Oceans” and “You Make Me Brave” make great soundtracks while you reflect on that question. I grew up in a Charismatic/Pentecostal church in the 80’s and 90’s, when revival was a buzz-word. Church today is just not comparable to the way it was. 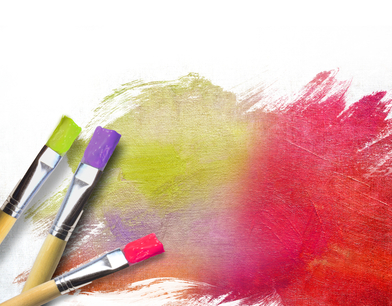 Creative ministry has radically changed in the last twenty years and become so much better. We had the flag baton twirlers, the hand-held banners with the Hebrew names of God appliquéd on them, ladies who would prance around waving quilting circles with ribbons attached to them, dubbed the “glory hoop.” We sang the imitation Jewish songs in the minor keys with no break between them. We laughed in piles on the floor through the Charismatic Renewal of the 90’s, and started crawling our way into contemporary worship with Ron Kenoly and “Ancient of Days.” It wasn’t snake-handling weird, but it got pretty rowdy. It wasn’t white steeples, hymnbooks, and wooden pews sedate Christianity. Church was deeply experiential, with a focus on the idea that God isn’t distant and disengaged, but the reverse. As we put our attention on Jesus, our awareness of just how close and how interested God is in us is heightened to the point that we could actually sense the divine in our services. During some of our most spiritual moments in church, leaders used to come forward and prophesy that revival was coming. It was a theme we revisited several times a year, and we were deeply passionate about it. From my childish perspective, revival was that magical moment when people, prompted by the Holy Spirit, would spontaneously begin to flood the church, getting saved en masse. I understood this to be something divine, a movement of people totally manufactured by God. We were waiting for God to do something huge. In many ways, I don’t think that much has changed in church life. We still value the same things; it’s just the creative expression that has changed. Churches like Elevation or Hillsong New York, which have seen rapid, massive growth are celebrated and respected. Most people don’t label this as revival, but it’s the same concept: lots of hurting people meeting Jesus, coming to church services, finding wholeness again. I question whether this happened as a result of a spontaneous divine movement. I’m not even sure that this kind of revival is a real thing. Sure, I know about the Great Awakenings, and moments in history when society moved back toward God. I just think that there is more to it than the Holy Spirit suddenly deciding to move. Does he love our generation any less because we haven’t seen the kind of revival that Jonathan Edwards saw? The obvious answer is no, so there must be another explanation. Jesus told us to go and make disciples for him. There is nothing passive about his final instruction. There’s nothing in there that can be interpreted as waiting in church services for people to spontaneously show up. It’s active language—go, make. We do all we can do, and God does what only he can do. We go get them, give them the message of truth; and God wakes up their spirit inside them, stamps them with the Holy Spirit. We train them, and we love them; include them in our community. Perhaps because Christianity is based on mysterious, spiritual concepts, we tend to approach our church services the same way. We have tricked ourselves into believing that the most spiritual moments happen in the moment, and that understanding the processes that create revival makes it somehow less spiritual. When you boil it down, however, churches that are growing fast do certain things well. Growing churches know how to use momentum. Momentum is the residual force created by the effort of the past, still working in the present. Momentum is not magical, and it’s not supernatural, but it can multiply the effectiveness of the work we do. God will breathe on what we do, with or without momentum. It’s just that with momentum, we are able to speed up the pace of growth. Force has to be continually applied to keep momentum going. Momentum is never self-sustaining. Even the strongest momentum will eventually fade. We have to continually push, but momentum has the ability to exponentially increase the force we are pushing with. With positive momentum, the same efforts will produce stronger results. Negative momentum will limit the effects of our efforts, producing less effective results than starting from a standstill. Positive momentum makes you look better than you are, and negative momentum makes you look worse than you are. Momentum is not as mysterious as you might think. We can manage the ebb and flow. Smart leaders learn when to push momentum forward, and when to glide on top of the momentum they have created, allowing their team to breathe. Intuitive leaders are tuned into their teams, and can sense how hard and how fast the team can push without reaching exhaustion. On the other end, when we are riding the wave, leaders have to read momentum’s slow down and mark the right place to start pushing again. Pushing from a standstill is much harder than pushing with the assistance of the wave of momentum. In a church context, the push that creates positive momentum has basically three essential parts. All three of these elements have to happen concurrently. We build anticipation for our services, make great services happen, and then build expectation off of great services toward what is coming next. Momentum is built from event to event, from weekend to weekend, from series to series. * Advance planning for church services. You can’t promote what you don’t know. The best planning happens as a team, without the pressure of time, in a creative environment. Your planning shapes what you will advertise about upcoming services. * Advertising. 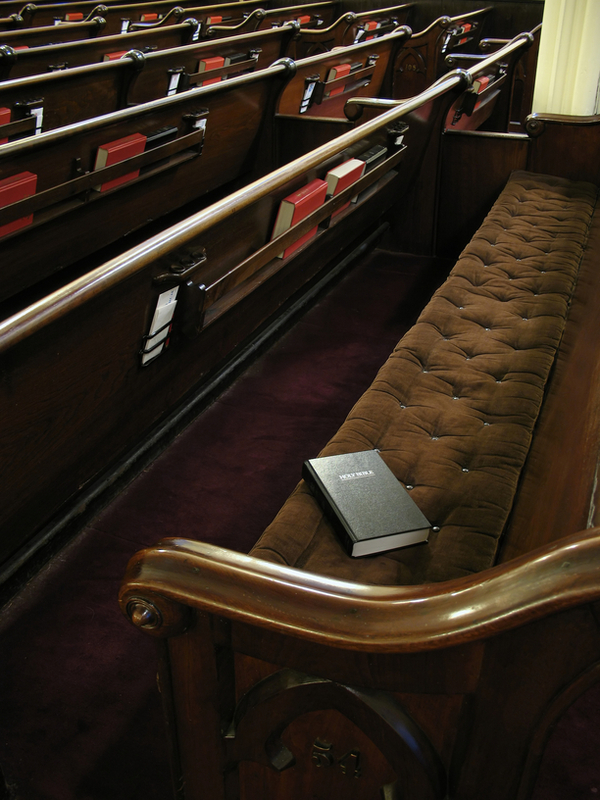 Advertise to your church attenders and to your community. Make it a regular part of your budget, not just when you have a big event. Advertise your Sunday service—it’s the main event! * Branding. You attract people like you. You won’t attract anyone if you don’t know who you are. Make it look good, keep it simple, and make it easy for anyone to understand. * Leverage your talent. Everyone is not the same; everyone is not equal. Don’t pretend like they are. Everyone has something they are good at, and it’s up to leaders to make sure people are able to win by doing what they do best most of the time. * Be great. Never settle for okay. Keep pushing for great without getting nasty. Pay attention to the peripherals. * Connect, both on and off the platform. Make it feel personal, not general, even in large audiences. Keep thinking about what makes a service experience great for your attenders. * Be memorable. Deliberately design memorable moments in your service. Think about what can become a talking point for church attenders, something that might spark a conversation later. * Use series. People look forward to the next installment. It’s why the literary trilogies and film trilogies work well. If the first one was good, we come back for number two and number three! * Maximize the afterglow. There is a reason Hollywood after parties are a big deal. This happens through highlight videos on Youtube, social media feedback, hash tags for pic posting. Celebrating what happened makes people feel good, but it also keeps people talking about it. * Consistently be inviting. Don’t have an event/service without inviting people to what’s next, with dates, and why it’s unmissable. * Follow up. Close the revolving door through repetitive, consistent, thorough, relational follow-up. You don’t have to stalk people for it to be good follow-up. This process may seem a little clinical or business-like because it’s straightforward, but don’t let that turn you off. Girls especially like church life to be very relational and organic. I’m all for that, but left to our own devices, we tend to keep to our own small circles of relationship, so we have to do practical things that intentionally broaden our potential circle of friends. In most churches, multiple different teams look after all these things. Even though we may be directly responsible for just one area, it’s better to have a sense of ownership of the whole. If every team just focuses inwardly toward their own responsibilities, gaps happen between the teams. Tiny little details are forgotten in no-mans land, not directly assigned to anyone. The stuff that falls through those cracks is usually the difference between good and great. I was in a church recently that deliberately cross-supports from team to team. Every team supplies something to another team, and is also dependent on another team to do something for them. No team is fully self-sufficient, so they can’t isolate. Forcing collaboration across teams means that church is far less likely to miss important details. This interesting model has built great team relationships and collaboration. Thinking broader can feel overwhelming if you haven’t done it before. If you are barely handling your present to-do list, then the thought of adding everyone else’s to your own can make you edgy. God stretches us so that we can help carry the weight for more and more. That’s one of our leadership journeys. Some people are incredibly detailed and can manage the complex workings of this process with ease, but not everyone can. Usually we have to work together to keep this process moving forward. Most of us girls are not the final say in our churches. If you aren’t the pastor, it can be easy to throw your hands up and say, “Sounds great, but I can’t make this happen; I don’t have the authority.” I understand that feeling. I do believe, however, that if every idea has to come from the pastor, and nothing can happen unless the pastor says so, then a church is incredibly limited. We are all gifted uniquely. We are God-designed to complement each other, and each one of us has something unique to bring to the body of Christ. I would a thousand times rather have a team member that I have to reign in than someone I have to push. The most high-functioning teams don’t wait on anyone. Their leader is like a horse and carriage driver. The team is the power that carries the leader forward, but he sets the course, making small corrections to keep everyone moving together toward the same target. Low functioning team leaders are more like donkey herders. The leader isn’t getting carried anywhere, but is pulling the team along, trying to herd everyone toward the same target. In the best teams, the engine, the drive forward, comes from the team, not from the leader. The direction comes from the leader. When you understand your value to the church, it’s much easier to take initiative. It’s exhausting for senior pastors to always have to be the first to think of everything, the first to call a meeting, or to design a campaign. What would it look like if instead of coming to your pastor with a list of questions that need answering, or problems that need his attention, that you came with options, or solutions he can choose from. Don’t wait for him to ask for it, just provide it like he already did. Be the engine; make things happen. Learn to lead up as well as you lead down. Some people are impeccable housekeepers. They sweep and mop their kitchen floor every day, vacuum every other day, whether they see any dirt or not. I’m more of a clean-the-dirt-when-I-see-it-on-the-floor kind of housekeeper. When the job clearly needs doing, I step up. I’m more of the spring-cleaning kind of gal. I’m not unusual. People will rally once around a major job that needs doing. We can call an all-church cleanup day on a Saturday and get a pretty good turnout of helpers. Repeat that again the next week, and participation drops off considerably. By week three, you will probably just have a handful of people. Why is that? People will not regularly rally around a task. The idea that a whole bunch of work needs doing, and we need your help doing it inspires no one. We can appeal to people’s sense of duty, but they will only go as far as their internal duty obligation extends. I chat with leaders all the time that need help getting their responsibilities done. It’s repetitive work that has to be done all over again every week. Some Christians have an innate sense of responsibility toward the work of the church and step up. Many people, however, just don’t have that, and leaders struggle to get them to involved. Appealing to a non-existent sense of duty will only get you resented. If we rally people just to do tasks every week, they will wind up feeling used. If our “team” consists of a to-do list on Sundays, we don’t actually have a team. A team has specific dynamics that synergizes it. There are certain elements that glue teams together. Without this glue, we aren’t a team; we are individuals with joint to-do lists. A disconnected team member tends to get an attitude like a teenager looking at a list of chores on a Saturday morning at 7am. It can be a little ugly. So what do people come out for again and again? What makes people feel like they are part of a team? Our church used to have a softball team that participated in a local church league. Every Monday night, the team would get together and play a casual game against some other church. My husband played on that team, and I spend a number of Monday nights cheering on this mediocre effort of athleticism with a handful of other wives in the bleacher. The team didn’t win often, but that wasn’t really a big deal, because the guys just liked to play for fun. It was a hobby. Teams that don’t care about winning, that get together only for the enjoyment of playing the game are made up of hobbyists. These guys enjoy getting outside and tossing a ball around a field, but they are not serious about the game. They usually just show up on game day, but they aren’t putting in time sharpening their skills, getting in shape, or practicing their skills. They will never be professional players. If you want to win, you have to practice. I think most of us get that. Hobby teams will never attract great players. Great players want to win. They are willing to put in the hard hours of practice in order to win, because to them, winning is the only reason to play the game. 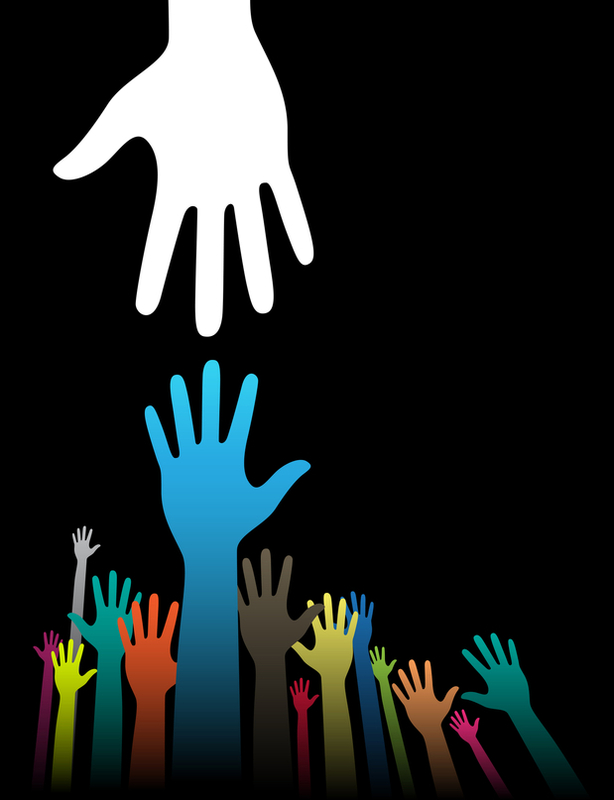 I can’t begin to count the number of times I have heard the phrase, “they are just volunteers; we can’t ask much from them.” This idea is one of the most sabotaging mindsets on church teams. It keeps us asking the bare minimum from team members—just show up on game day (Sunday), and help us out for an hour or two. We will not build great teams if we buy into this thinking. People will say yes to a team that wins, even if it means they are signing up for a bigger commitment. Parents and kids say yes to long hours in practice and on ball fields for teams they think will win. They will pay for uniforms and dues and the trips to get to out of state games—with pleasure. This is not because watching twelve year olds play ball is so riveting. It’s because they want to be connected to something that wins. I have seen highly functioning teams give amazing amounts of time, resources, and energy. Why? Because gifted and passionate volunteers will give just about anything when their team is winning. In the context of church, winning is far bigger than a team getting their assignment done. If completing a task is the big win, people will only give us what their sense of duty affords. They will give us their leftover time, not their scheduled time. 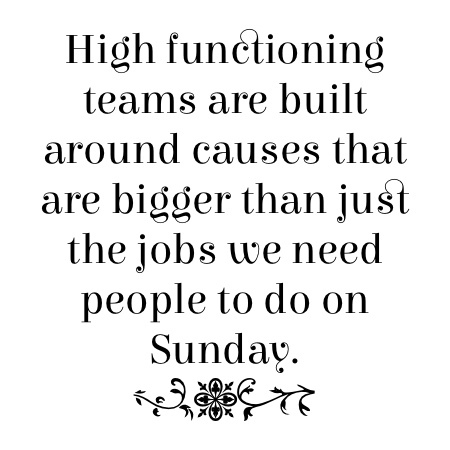 Highly functional teams are built around causes that are bigger than just the jobs that we need people to do on Sunday. We can’t communicate culture, vision, training, or build community on Sunday while we are working. It has to start by rallying our team around a weekly team meeting that happens outside of Sunday services. It’s pretty typical for teams that aren’t already doing this to question whether this is even possible. After all, if you can’t get people to show up on Sunday, then why would they show up on an extra night? As counter-intuitive as it might seem, teams that meet outside of Sunday service actually have better show up rates on Sunday. When we are inviting people to join us in reaching for the eternal souls of humanity and easing their present suffering, no more compelling cause exists. They will come to a meeting if they see the value in what we are working toward, their time respected, and their efforts paying off. We don’t have to worry about managing people’s obligations. They will do that just fine themselves. They will tell us when they have to work, and when their family needs them. They will freely say no. No one is forced to do anything. Church volunteers aren’t slave labor. People can say no whenever they want to. If we never ask, however, we rob them of the chance to say yes to this great cause. People will keep showing up when they believe that they are working toward a noble cause. In church life, every task, no matter how basic or menial, has a connection to the cause of Christ. People cleaning toilets are creating a fresh, appealing, inviting environment for seekers to come to and connect with the church and connect to Christ. People copying of children’s curriculum are investing in the next generation, training young leaders and Christians. If leaders will keep pointing their team members back to the larger cause, then simple tasks become far less of a mind-numbing bummer. It’s our job as leaders to show people what part they play in the body of Christ, and how their work matters to what we are doing. The cause of Christ is simple—to seek and to save the lost. If we will regularly remind people of the why, they are far less prone to burning out. Good church leaders see potential in Christians before they see it in themselves, and help them connect their love for Jesus with a practical work of service. People will keep showing up when they feel like they belong. Leaders can’t hand out a sense of belonging. I can give you a membership card, a nametag, a uniform, or a sash with merit badges, but I can’t make you feel like you belong. We can’t make people feel anything, but we can create environments that help our teams connect. People feel like they belong when they are having fun. Nothing makes me feel more connected to a person as when we have had a good laugh together. When real work needs doing, however, this is hard to remember for most task-driven, middle-level managers, me included. We feel this compulsion to keep everyone focused on the work at hand. People feel connected when they are having conversations about real issues they face, or the real issues I face. People will keep showing up when they know their own value to the team. It’s easy to get frustrated with under-performing team members. When someone doesn’t show up, or doesn’t do what they committed to do, it means that the leader has to pick that back up. It’s easy for us to begin to treat people who do this with a little distain or irritation. Even when people are failing their team by not showing up, it’s possible to communicate their value. We can be smart with our verbiage, using phrases like, “we missed you,” or “you matter to this team; Sunday wasn’t as strong without you.” I’ve said both that a no-show is not okay and that you are valued on our team. If we just fill in their place on the team and move on without comment, they never know how much we were relying on them. We aren’t just letting them off the hook; we are actually devaluing them. People will keep showing up when they know that we know where we are going. Volunteers who serve because they like their job will be committed to that one role, but they aren’t going to think beyond those responsibilities that they prefer. Teams that catch a larger vision for what the whole church is doing will fill any gap that needs filling, even unasked. They will help other team members, doing whatever needs to be done to make sure that the whole team accomplishes its mission. Sharing vision is time consuming, but incredibly worthwhile. Our teams aren’t going to catch the vision from listening to our pastor talk about it once a year on vision Sunday. Every meeting should communicate vision at some level. Vision helps define our strategies, helps us measure what is working and what isn’t. Vision should make the decisions about our annual calendar. Building a team does not happen overnight. Team building happens one conversation at a time, and one individual at a time. Leaders who are committed to building a great team over a long period of time wind up accomplishing great things for God. Get ready for a slow pace. Team building is always going to be a little bit messy, and that’s both okay and healthy. People get radically saved, but people don’t get radically discipled or trained. It never happens overnight. There is a reason it takes twelve years to become a doctor. Building something that is quality takes time. Our impatience with that process only creates unnecessary pressure that puts people off, so chill out. Chilling out doesn’t mean we sit back and wait for something to happen, it means that while we are working hard to connect, train, and build people, we do it with the fruit of the Holy Spirit—peace, joy, patience, and the list goes on. God is doing something great and he has an eternal time frame, so hang on, my friend!